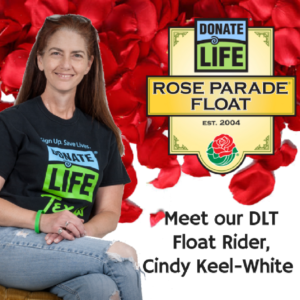 Donate Life Texas is pleased to announce our delegate for the 2017 Donate Life Rose Parade Float – Cindy Keel-White, a heart transplant recipient from Odessa, Texas. For Cindy, a childhood battle with Hodgkin’s Disease ultimately led to the need for a transplant in 2011. Since then, Cindy and her husband Steve have become active and passionate advocates for donation throughout West Texas. Cindy regularly attends events and makes presentations to groups about the growing need for transplants and the importance of donor registration, including recent visits to Texas Department of Public Safety Driver License Offices in Midland, Odessa, Monahans and LaMesa among others. She’s so active in fact that the organ procurement organization serving Midland / Odessa, Southwest Transplant Alliance, named her as their 2015 Regional Volunteer of the Year. The Donate Life Rose Parade float is an annual parade tradition to celebrate donation and its unique power to save, heal and transform lives. The float is accompanied each year by donor families, living donors and transplant recipients. It also is decorated with floral portraits, called floragraphs, of donors who have given the ultimate lifesaving gift of organ, eye and tissue donations. From her seat aboard the Donate Life Rose Parade Float, Cindy will join other donation advocates to share the message of donation with the world. And, in a delightful coincidence, Cindy’s middle name is…Rose. For more information, visit the 2017 Donate Life Rose Parade Float website.